There are a number of auto industry disrupters who have developed business models and created tools to improve the customer experience by addressing some of the major areas where consumers are dissatisfied. Here are six tactics to transform your car buying process and engage the modern consumer. Many studies show that vehicle shoppers are not satisfied with the current car buying process and would prefer to complete the vehicle purchase process online if possible. Current industry disrupters, such as Roadster, Drive Motors, and Carvana, are catering to these consumers by providing a real e-commerce experience that allows consumers to complete the vehicle shopping process without setting foot in a physical location. This process may not be realistic for every dealership at this point, but it’s time to start moving in this direction by improving research tools and allowing shoppers to carry out the majority of the buying process online. In the same Auto News article, Mike Jackson, CEO of AutoNation mentions that they understand the frustration a consumer faces with the disconnect between an online experience and an in-store experience. “We see that as an opportunity,” said Jackson. Dealers need to improve the vehicle shopping experience by providing a seamless transition between the online and offline processes. Again, there are some challenges in providing a complete e-commerce experience for vehicle sales, however, visits to the dealership should be quick and painless after doing most of the legwork online. GoMoto has designed a solution to expedite the in-store buying process for consumers who have already started the shopping process online. 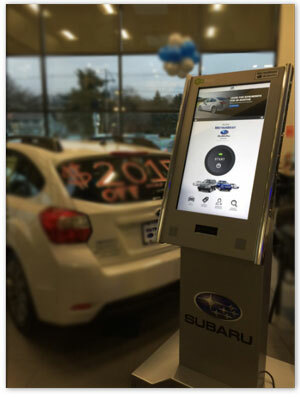 As consumers enter the dealership showroom, they can check in at a kiosk or “digital HUB” by license, allowing the sales associates to quickly access all the information the dealer has already obtained online. This helps drastically improve the consumer experience by providing useful tools to help reduce time spent at the dealership. The majority of vehicle shoppers start their vehicle research online, and many of them don’t know what they are looking for. According to the 2016 Car Buyer’s Study conducted by IHS, 70% of new vehicle shoppers are unsure which vehicle they'll buy next, and 6 out of 10 are open to different makes and models. 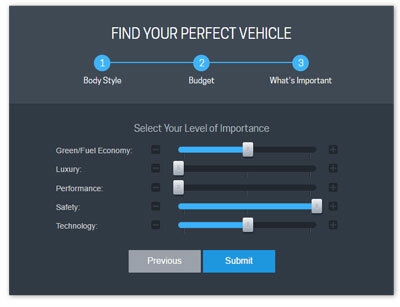 Provide a vehicle shopping experience that allows consumers to research vehicles based on certain attributes that are important to them. Confining consumers to a Year, Make, Model search experience is overwhelming for the 70% of vehicle shoppers that don’t know what they want. This is why major companies such as Amazon give the option for shoppers to find products based on certain criteria, without requiring any knowledge of certain product makes or models. One of the major challenges vehicle retailers face in moving towards a real e-commerce experience is the need for consumers to test drive their potential vehicle of purchase. Selling a product that consumers can’t physically see or try out is an obstacle other e-commerce retailers have had to overcome in the past and are likely still challenged by. Completing a vehicle sale online is an even greater challenge given that it’s the second largest purchase decision most people make. 88% of customers will not buy a vehicle without test driving it first, according to a 2015 AutoTrader study. An industry disrupter, Shift, not only allows potential customers to test their vehicles before purchasing but will deliver the test drive with a “car enthusiast” to help answer any questions. And similar to Carvana and Vroom, they offer a 7 day/250 mile return policy with no questions asked. Some of the OEMs are starting to head in this direction, such as GM’s “Shop Click Drive” tool that allows consumers to test drive upon delivery with no obligation to purchase. In order for consumers to complete the online vehicle shopping process online, retailers will need to improve their current test driving process. On most websites, it’s difficult for consumers to identify the true condition of pre-owned inventory. Cosmetic damage is hard to see in an image, even some of the highest quality vehicle images. The mechanical condition of a used vehicle is another ball game. Some of these disruptive startups are really catering to the consumer by showing complete transparency. For example, Carvana provides high-definition, 360 virtual tours of every car, highlighting the vehicles features as well as their imperfections. Shift includes a 200 point inspection for every vehicle that notes any issues they find (usually not many), and also includes images of a vehicle’s cosmetic damage, similar to eBay listings. Transparency is one of the best ways to win over your potential customers and retain their business for years to come. Consumers want to buy from a business they feel they can trust. Today’s consumers want to know what prices are fair and what they will end up paying for their vehicle upfront. There have been myths that consumers don’t like to haggle, which was debunked in the 2015 AutoTrader study referenced earlier. 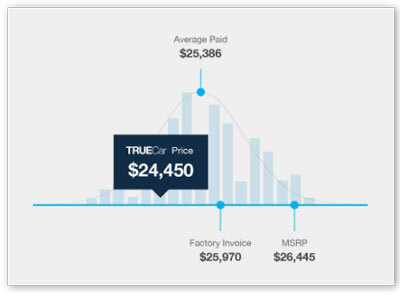 However, it’s still important to be transparent with pricing as another means of building trust. KBB, Edmunds, and TrueCar have been major players in holding dealers accountable with pricing transparency. 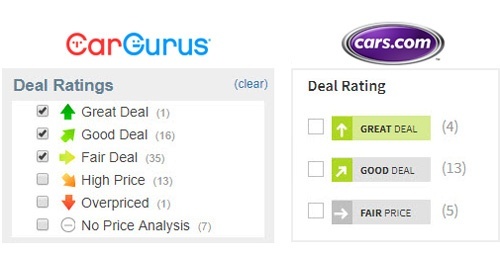 And some of the most popular car listing sites, including CarGurus and Cars.com, have implemented a deal ratings system on their search results pages (SRP) that rate each vehicle "great deal" to "overpriced," or "great deal" to "fair price." Shoppers are able to filter their results by this criteria, so you'd be shooting yourself in the foot by not pricing your vehicles competitively. For those that don't want to haggle, many of the current industry disrupters, including Shift, Drive Motors, Roadster, Carvana, and Vroom, as well as some of the largest dealer groups, including AutoNation and Sonic Auomotive, have adopted the no-haggle business model. All of these tactics that step outside of the traditional vehicle shopping box are starting to transform the auto industry. As a vehicle retailer, it's important to learn from these disrupters, not just to stay relevant, but to provide consumers with the best online and offline vehicle shopping and buying experience possible.